I was never a hairspray user since my last experience with a hairspray was how it gave me such stiff, untouchable hair! I like combing my fingers through my hair throughout the day. I have a habit of playing with my hair when I'm thinking or watching TV or reading a magazine. I can't be held back with touching my hair, hence my ban to all hairsprays. that now I don't let a day pass I don't use one of these hairsprays. Kenra Professional is a professional brand dedicated to understanding and serving today's stylists. Their passion is to develop the best-in-class innovations, delivering superior and reliable results. The three unique brand, Kenra, Kenra Platinum and Kenra Color are each driven by the daily needs of stylists. A complete range of high-performance products combined with straightforward and accessible education gives stylists the confidence to address every client's needs. So how did I test five different types of hairsprays in a span of 4 weeks, when I don't really style my hair as often as I like??? Well, I kept all these bottles on top of my vanity so I remember to use them every single time. For every hair problem I had such as frizz, flat hair, dullness and so on, I grabbed one of these to see if it worked before I went to my drawer of other hair products. On days I just want to tame my baby hairs and remove any static on my hair, which is most of the time, I use the Kenra Perfect Medium Spray (medium hold) . I wash my hair at night and by the next morning, all my baby hairs and frizz are out and about. I spray the Kenra Perfect Medium Spray on a small brush and brush this throughout any frizz. This also leaves my hair shiny and doesn't leave my hair all stiff. I was really curious how the Kenra Platinum HiDEF Hairspray (matte finishing spray) worked since this has a NEW Matte Finish Technology. I tried using this on my no-heat wavy hair and it did give me that matte finish and texture I needed to have that "bed hair" kind of look. It has such an ultra fine mist, just like all the other Kenra hairsprays as well. My hair didn't feel stiff either and it definitely held the waviness of my hair throughout the day. On days I did style my hair, and used a curling iron, I used the Kenra Platinum Finishing Spray (maximum hold) because I want my curls to last longer than three hours. This gave my hair that high-shine finish, so I didn't even need to grab a hair oil to add shine. It also tamed any frizz I have, and it really kept my curls last all day without that stiff hold to it. I could still run my fingers through it and the curl held up without going flat until the next day! So on my second day hair, I used some dry shampoo on my scalp and used the Kenra Volume Spray (super hold) all around my still-kinda-curled hair to give it some more texture and body that did last all day. 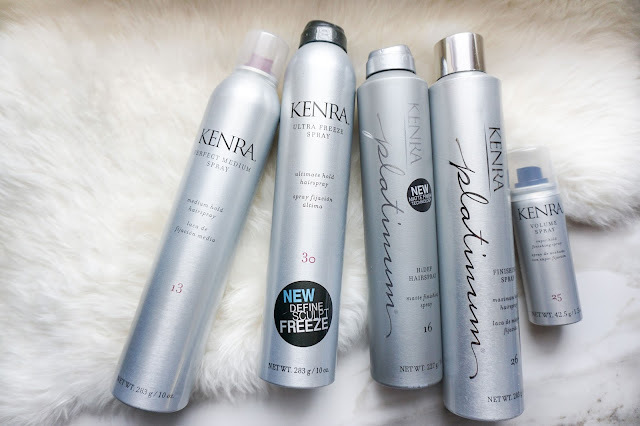 I've only used the Kenra Ultra Freeze Spray (ultimate hold) on days that I have my hair in a bun or ponytail and I just want everything to be sleek and shiny. This definitely kept my hair in place, especially on those windy days. So if I don't want to be bothered with my hair, I grab this to keep any unruly hair away from my face and it helps keep my bun or ponytail looking "perfect". All these hairsprays has an ultra fine mist which I love! It also dries instantly but doesn't leave my hair feeling stiff nor untouchable. For dull hair, grab the hairspray that has a high-shine finish because it really gives your hair that shine without weighing down the hair like what some hair oils would do. You can also find Kenra haircare products at Ulta.com if you are in search of a new hairspray. Have you tried any Kenra haircare products yet? Will you be grabbing one of these hairsprays?